Matt Cutts Keynote with Amit Singhal was addressing how Google has evolved in last couple of years and what they are planning to do in next coming months. 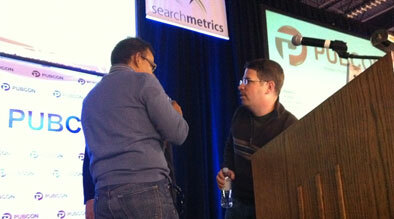 Matt started the keynote by addressing to Leo Laporte’s comment “SEO was dead”. SEO is not dead because SEO is a type of marketing, and marketing appeals to human nature. It is not going to go away. We are now doing radically better communication. Mobile – long-term SEO trend. How your website is going to look on mobile. Cell phone is a computer. Social – if pages are blocked from Google bot, we don’t have that information. If we can move from anonymous web, to where everybody is going to have some idea about the author, the web is going to get better. You don’t necessarily have to optimize for search engine. Communication and Transparency – tell people if their WordPress is out of date. Looking of doing this for more and more software packages. Send an alert if your website software is out of date via Google Webmaster. Why do the big brand always take the top site even though there are specific niche websites? Will creating Press Releases (PR) be flagged as duplicate content by Google? PR might not be that effective for long term. Authority of the author is important. If you were to describe in few sentences, what is an ideal site that Google is looking for to include in its index?